Ease of use: The website and software is very well designed and aesthetically pleasing. The software in general does have a good layout, in particular the dashboard is very informative and well laid out. However we felt that there were just too many menu items, which could have easily been cut in half. All together there are 163 menu items! This makes it very hard to get used to the software and some time will need to be invested navigating around and getting to grips with it. Speed: We think speed is a weak area for Clear Books as entering transactions can be quite an arduous process. For instance processing a payment for fuel would be a three step process, Step one: entering the date and amount etc. step two: explain the transaction, i.e. assign it to a supplier (even if it was an instant payment). 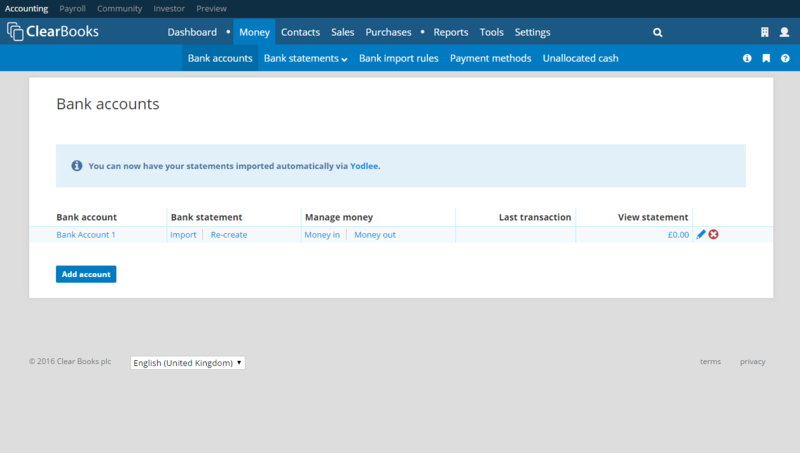 Step three: choose a payment method and check the VAT and invoice then add the transaction. For some transactions it would be unnecessary to enter and invoice or customer/supplier such as buying fuel and as far as we could see there was alternative method. So, if your business processes a lot of transactions you will find this software time consuming. However Clear Books does offer live bank feeds or bank import which can speed this up but even this can be slow. For instance once you have imported the transactions you will still need to explain them which takes time. We think this process could have been developed much more efficiently. Features: Clear Books does have a wide variety of features such as multi-currency handling, automatic bank feeds/imports, reoccurring invoices, direct debit integration, project handling, PO handling, payroll and HR. This software probably had the most features out of every one we reviewed. Support: The support also seems good, included in the monthly subscription is telephone, email, live chat and a community network. Only other help we would like to have seen would be some videos rather than the screenshots, although there is a short one on YouTube. Reporting: The reporting was a mixed bag really, the trial balance was good, with the ability to drill down into accounts to see how the balance was made up. However the profit and loss and balance sheet was poorly laid out and without the ability to drill down. The aged debtors and creditors were presented well with lots of stats when drilling down. One niggle was that the reports forgot the date you previously entered when navigating around causing a bit of frustration. Price: It is possible to get a low cost version if you have very basic requirements but most users will need the Together+ package. There are then additional amounts to pay if you would like the payroll and HR package. This is the most expensive software we have reviewed but it does have a good amount of features to justify it. VAT Handling: Clear Books handles VAT very well. It seems to have been developed for the UK which means that it can take care of cash accounting and the flat rate scheme. Only three packages that we tested could handle a switch between accruals to cash accounting and vice versa, Clear Books was one of them. The VAT reporting is also very good, a breakdown is given for all of the figures that make up the VAT return. The bits we liked: We really liked how well VAT was handled and the look of the software. The bits we didn’t like: We did not like the complexity and the time it takes to process basic transactions and the huge amount of menu items to figure out! You don’t need to be a professional to use this software but we do think a novice would have a hard time understanding everything. Some bookkeeping experience would definitely be required. Overall we liked Clear Books but it does take some getting used to. 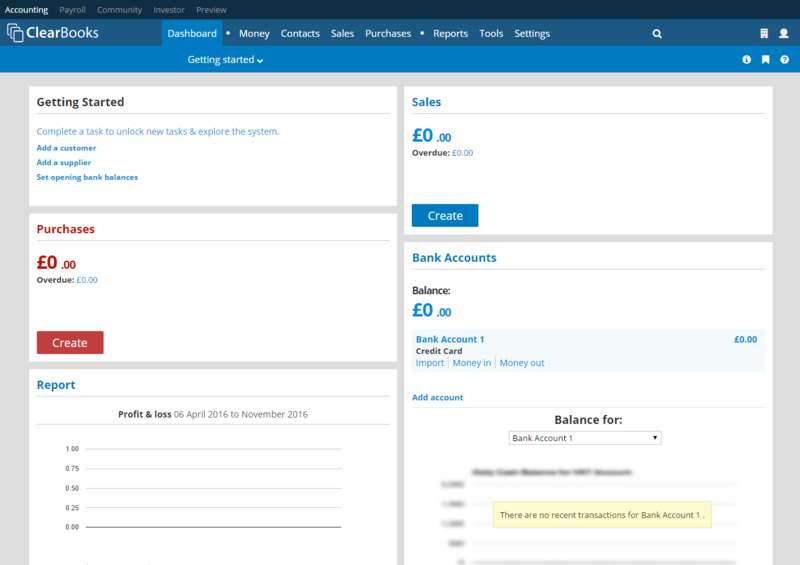 Professional Bookkeepers are unlikely to want to use this software but for a small business with a moderate amount of transactions it could make sense particularly if they like nice looking software and lots of features to play with.